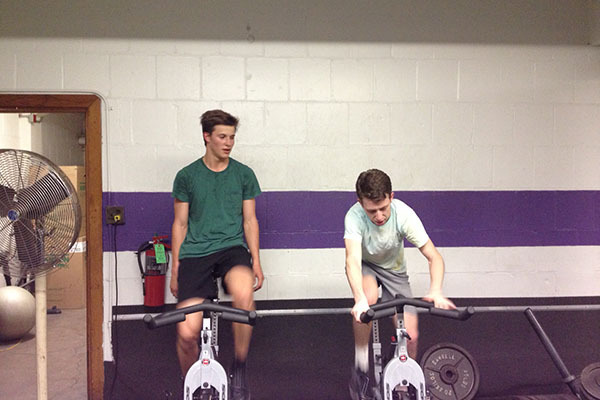 Rising sophomores Jacob Frazer and Alfie Astor train for their upcoming 3,000-mile bike ride across South America. The two students are hoping to raise $3,000 for the South American charity, TECHO. Two rising sophomores are set to embark on a 3,000-mile bike ride across South America. Jacob Frazer and Alfie Astor leave Tuesday for Arequipa, Peru, where they will begin their ride in hopes of raising $3,000 for the South American charity TECHO. “This is going to be a total adventure, total journey, and the biggest physical and mental challenge that I’ve ever embarked on,” Frazer said. Both Frazer and Astor had experience traveling before coming to Northwestern and said they originally planned the trip as a way to have an adventure before other responsibilities prevented them from doing so. Frazer and Astor are also using this trip as a way to raise money and awareness for TECHO, an organization with representation in 19 different Latin American countries. TECHO works to eradicate extreme poverty in Latin American slums by implementing construction projects and other social programs, such as schools and job training. Astor and Frazer will be collecting donations through their fundraising page on goennounce.com. They also plan on updating the page throughout their trip to raise awareness about the communities they encounter. The two originally found TECHO with help from NU Alumni Services. They ultimately chose to support its cause for several reasons, including TECHO’S model for how it serves communities. Juan Camilo Torres, the Director of Community Giving at TECHO, explained the organization serves many different communities in a variety of ways. Torres said one main goal of TECHO is to unite different social classes in the effort to end extreme poverty. Torres said he sees Frazer and Astor’s bike trip as a way to raise money, but also as a way to raise awareness about life in Latin American slums.